A safe and effective means of isolating enclosures must be an integral component of such a system. 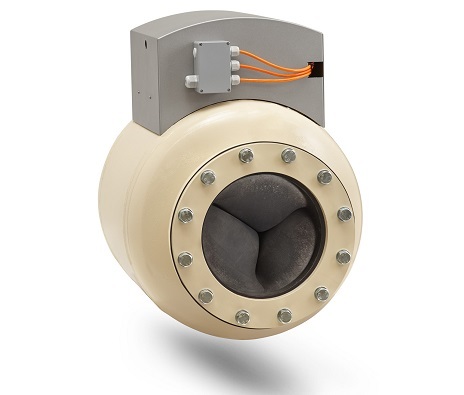 The new and improved REMBE Exkop isolation system is available for many more applications: for ST 2 dusts, reduced explosion pressures (Pred) of up to 2 bar and larger diameters. Isolation is essential to protect adjoining system components against the spread of combustible dust explosions. Tanks, silos, dust collection, and other equipment are usually connected by pipelines through which, if an explosion occurs, fire and pressure spread rapidly. In addition, the intensity of the explosion in connected containers is increased by pressure piling and flame jet ignition. This sequence of events can be prevented by the Exkop isolation system, consisting of a control panel and one or more quench valves. The integrated elastomer seal within the quench valve closes within a few milliseconds, triggered by a signal from an explosion panel, a Q-Rohr, Q-Box, an infra-red signal or pressure/ temperature sensors. The quench valve can be safely put back into operation again at the press of a button. The Exkop system is fail-safe and easy to test/reset. Whether it’s food, pharmaceutical, chemical, wood, or metal dust, the system keeps dust explosions safely in check.